At $157B in size and expected to reach $420B by 2025 (15%+ CAGR), Education Technology is a massive market that continues to expand on a global scale. 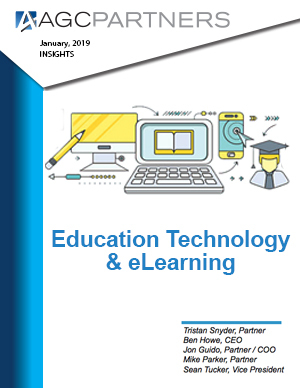 In first world countries such as the US with high cost delivery models, EdTech’s potential to unlock huge budgetary savings for governments and households alike is a powerful driver of continued adoption. In developing countries seeking to close the gap in language and IT proficiency with the rest of the world, the focus is more on access. Lastly in the corporate sector, where professional training has long been viewed as a discretionary item subject to boom and bust economic cycles, eLearning is gaining significant traction as a “must have” for many employers in a historically tight labor market. Armed with new innovations including Microlearning, Interactive Video-Based Training, AI, AR/VR, Adaptive Learning, and Gamification, investment in EdTech has gone viral and global in the last few years with each major region vying for control of the digital economy of the future.